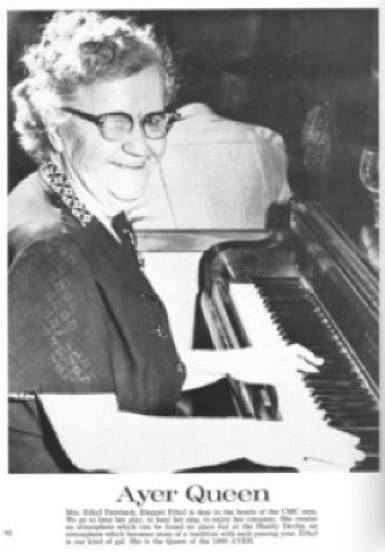 A local character of the 1950s and early 1960s, Ethyl Fernbach was a housedress-wearing matron who played piano and sang the standards at Shanty Devlin’s and later at Elegant Ethyl’s, a bar behind the Red Griffin Inn, both in Cucamonga. She was the subject of one of my columns, which you can read as an extended entry below. Anyway, she’s been memorialized on the Find a Grave website. A woman named Kym Winkler read my column and set up the page using excerpts of my column. You can view the page here. 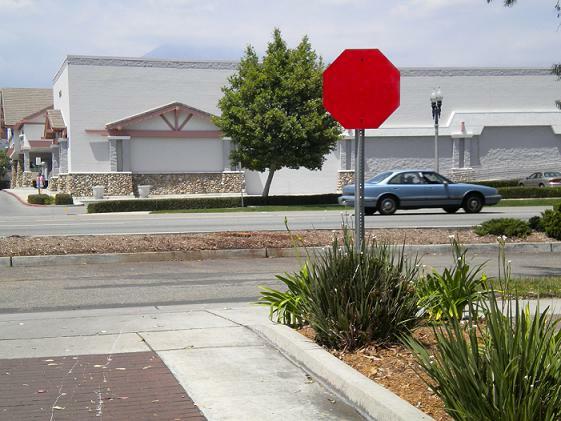 This stop sign in Upland near Foothill and Mountain has its message painted over. Officially? Unofficially? Unsure what to do, I stopped anyway. Click here for the 6-minute video the Pomona Public Library made of my interview concerning the 2007 Pomona Christmas Parade. Modesty forbids my reminding you who was grand marshal that year. My column today explains the video interviews the library has been conducting. Here’s the link to see all the completed videos so far. 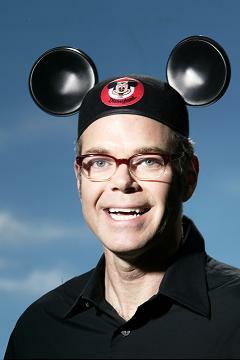 You can also watch them all on a bigger screen at an event at the library, 625 S. Garey Ave., at 1 p.m. Saturday. If you have a Pomona story, I highly recommend your participation. Phone the library at (909) 620-3709 or e-mail them at library (at) ci.pomona.ca.us to make an appointment or ask questions. “We’d like lots of people from the community to come in and do this,” says Bruce Guter of the library staff. Garden Square, 1401 Foothill Blvd., La Verne (at Wheeler); and 710 S. Indian Hill Blvd. (at San Jose), Claremont. Garden Square, a local operation, took over the former Bakers Square in La Verne in January, reopening less than a month after the location closed. Seizing an opportunity, the same owner nabbed the vacant Claremont Bakers Square and, although not as speedily, opened it as a second Garden Square earlier this month. I ate at the La Verne location recently for lunch. The interior still resembles a Bakers Square with the green-upholstered booths, oak trimming and pie case in front. I had a pretty good tuna melt ($7.99), but my so-so side salad was brought to the table at the same time as the entree. For dessert there are 20 pies on the menu. I had a slice of apple ($2.99). It was a sad thing, filled with that heavily glazed “apple filling” that comes from a can, not fresh apples, and consequently flat and mushy. The owner was working the register and he seemed like a nice fella. He told me he does all the baking and much of the cooking. I decided to give the Claremont location a try when it opened. So in I went for lunch on Monday. I got the chicken stir-fry pita ($8.49), which wasn’t what I expected, having (apparently) mixed up the photos on the menu and liking the looks of a wrap. Oh well. This was chicken, broccoli, mushrooms and pea pods, in way too much teriyaki sauce, spilling out of a pita. No way to pick it up, so it was eaten knife-and-fork style. I’ve never seen this odd dish before and would suggest it be quickly retired. Deciding to give the pie another shot, I tried banana cream ($4.29). Better than the apple (whew), but nothing special. If I want pie, I’m going to Flo’s or Corky’s or Marie Callender’s, where the extra calories won’t be wasted. Certainly I wish Garden Square every success and am pleased to see these two chain restaurants in local hands. It’s possible the places are better than when they were Bakers Squares. (Some on Yelp say so and the people in the booth behind mine on Monday thought so too.) They do breakfast, lunch and dinner and they have a seniors menu. But based on my uneven meals there, life is too short for me to go back. I’m gonna be there starting today for a conference by the National Society of Newspaper Columnists featuring panel discussions and workshops on the craft of column writing, branding, achieving longevity or, if that fails, post-newspaper careers (sigh), etc. Last year the group met in New Orleans, which proved to be one of the best trips of my life. Ventura? Nothing against Ventura — for one thing, it has some great used bookstores, and obviously it will be cheaper for me to get there — but since it’s in my backyard, it’s less exotic. Maybe the Louisiana folks tired of New Orleans will be excited. Anyway, the usual vacation rules apply here: When I have access to a computer at the hotel, I will log on and post your comments. So be prepared to wait a while before you see them here. And yes, there will be posts here Thursday and Friday, and columns will continue appearing. 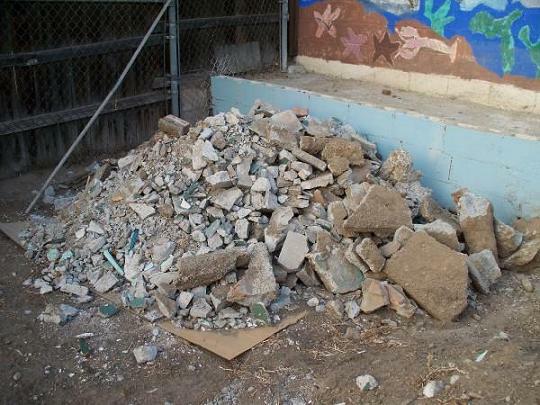 A probably emblematic Inland Empire Craigslist posting, headlined “Broken Concrete Pieces (Pomona 909).” Caption: “Pile of broken concrete. Not much to say about it.” It’s free if you want it. Thanks to reader Mason Stockstill for the link. 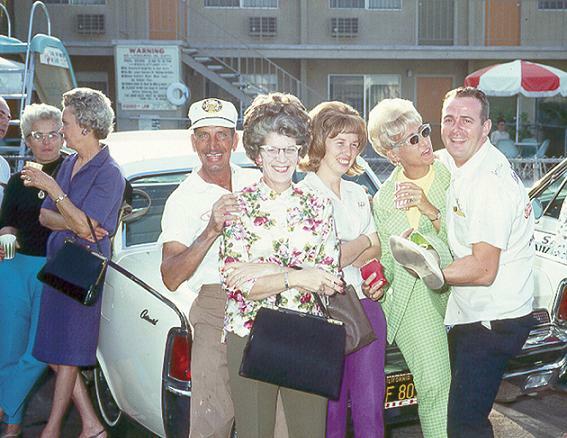 One day before its mention in my column, here’s a tip: Phoenix will be hosting one of his ultra-entertaining slide shows — title: “Charles Phoenix’s Retro Slide Show Tour of Southern California” — at 8 p.m. Saturday at Pomona’s NHRA Motorsports Museum. Expect ’50s and ’60s slides celebrating car culture, space age suburbia, fast food stands, shopping centers, drive-ins, Hollywood landmarks, Knott’s Berry Farm, Marineland and Disneyland, among other places. The museum is at 1101 W. McKinley Ave. Enter at Fairplex Gate 1. Cost is $25 at www.charlesphoenix.com or, presumably, at the door. 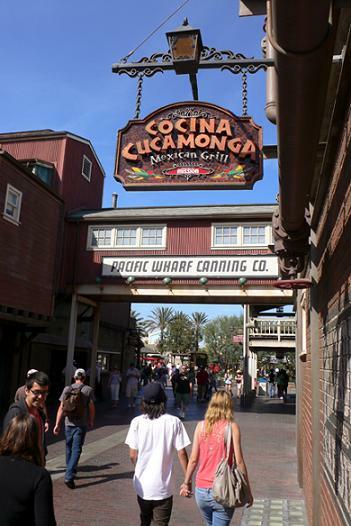 I haven’t been to Disneyland in 20 years, and I’ve never been to California Adventure, but friends tell me there’s a restaurant at California Adventure named Cocina Cucamonga. And here’s a photo to prove it. Next door is a tortilla-making tour sponsored by Mission Foods, which is based in Rancho Cucamonga and which hosts the restaurant, thus explaining the choice of name. On the Mission Foods website in the “At a Glance” section, note that among the 19 plant locations is one in “Rancho CA.” I guess you have to go to Anaheim for the “Cucamonga” part. My May 13 column on Jim Bowman’s memories of growing up in Ontario in the 1950s and ’60s prompted a loooong e-mail from reader Linda (Shaffer) Frost amplifying on some of Bowman’s points and dropping new names of old-time Ontario businesses. And if you’re into that sort of thing — which we here at The David Allen Blog most assuredly are — then the nostalgia makes for good reading. “Since I am waxing nostalgic, I have a few things to add to Jim Bowman’s recollections about Ontario back in the day. I grew up there, too. I would have been born here had it not been that my father was stationed in Massachusetts during the war. I was 18 months old when I arrived in January of 1947. “The first thing my parents did after purchasing a home was to subscribe to the Daily Report and to begin Shady Grove Dairy delivery. The bottles were glass and had tiny cardboard caps with a pull-tab. Cottage cheese came in colorful, anodized aluminum tumblers, and oleo came in a plastic bag with the dot of color. Owl Lucky Star Market was the first supermarket, followed by King Cole Market, and shopping was a family affair. “Laddie’s hamburgers, the first fast food hamburger stand, charged 15 cents for a hamburger. Yes, the Hot Dog Show held constant performances in a hot dog-shaped shop with a few stools in front. Taco Lita held court at the corner of San Antonio and Holt (previously A Street), and tacos were five for a dollar. Yes, and Mi Taco had its first store on East Fourth Street across from John Galvin Park. Unfortunately, Ford Lunch had a reputation for racial discrimination, so my parents never took us there to eat. “My mother didn’t believe anyone should be mistreated, especially for race, and when it happened, she never forgot. FYI, another incident occurred back in the early 1950s at a place called Ed’s Caf on “A” street, when Ed refused to serve a black boy whose team had played my brother’s team in Pony League baseball game. His team didn’t eat there, and we never went to Ed’s either. My mother had nothing good to say about Ed or his caf. “The California Theater gave competition to the Granada. On Saturday mornings, our mothers would pile us into the family sedan and haul us downtown where we would pick up tickets to the free kids movies on Saturday mornings. Popcorn was a dime, and big candy bars were 25 cents. We would go to Newberry’s and spend our pennies on Evening in Paris cologne in tiny blue vials. I can still smell it and am happy to say that my fragrance choices have improved with age. “A highlight of every summer afternoon was walk to the plunge at Chaffey High School with a quarter tucked inside our bathing caps for the price of admission. That lasted until the polio scare sent us home to inflatable pools in our yards.